As African American Women, you have a need for specific products that are made with you in mind. African American skin care products that are formulated with your skin in mind, take into consideration the beauty of your melanin. It�s not necessary to use harsh chemicals and detergents on your skin in order for it to be cared for. In order for your beautiful black skin to maintain its radiance, a simple skin care regimen of cleansing, toning and moisturizing is a great place to begin. Cleanse with a cream based product and you give your skin the gentleness needed in order not to bruise, scratch or aggravate any existing conditions. Green tea is a great ingredient in a product for African American skin. It allows you to keep them guessing about your age when you use a non-foaming green tea facial cleanser. Ideal for giving you that ageless and flawless look that is common for women of color, our specially-formulated for African American skin Green Tea Facial Cleanser is perfect for deep cleaning and peeling away layers of damaged skin without leaving any residue. For hundreds of years, women in Asia have been using green tea as a beauty aid for their dark skin, helping them look years younger. That�s because green tea fights sun damage and kills bacteria that destroys your skin. A vitamin-enhanced formula is perfect for any skin type for women of color. Whether you have sensitive, mature, dry, sun-damaged, combination, or normal skin, you will find that a Green Tea Facial Cleanser cream gently deep-cleans each pore, leaving your beautiful brown or black skin with a vibrant glow that everyone will notice. Toners hydrate and balance the pH levels of your African American skin, giving it a fresh and clean glow. The organic aloe barbadensis leaf juice in our formula contains seven of the eight essential amino acids and provides nine essential minerals to rejuvenate and revitalize any skin type for women of color, including sensitive, acne-prone, mature, dry, sun-damaged, oily, normal and combination skin. Nyraju�s Rosewater toner made with rose essential oil, not only adds a mild and relaxing scent, but also nurtures, strengthens and soothes your skin. With a Moisturizer It�s all about the ingredients! Specially-formulated for black skin care, finding moisturizer's that are packed full of antioxidants to fight any and every sign of aging imaginable for women of color is a great place to start. Wheat germ brightens and refreshes your beautiful African American Skin, giving it the texture of silk taking years off your face. Aloe vera stimulates new skin growth, helps cleanse, purify, and detoxifies your skin, leaving you with that clean, fresh from the spa feeling. Rosehip makes your skin more elastic, helping you look younger - bye bye, wrinkles! Avocado is a natural moisturizer and gives your beautiful black skin the texture of silk. 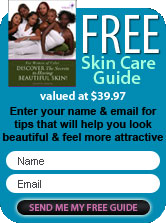 Three simple steps, Cleansing, Toning and Moisturizing will give your beautiful black skin the regimen that it needs.